Can you reconcile reducing consumption while creating a cozy and stylish home? I am a bit of a redecorating junkie. While I would like to always practice what I preach, on occasion I am guilty of impulse buying for my econest. I can’t kick myself too much because on close inspection, if I hold a mirror up to my consumption habit, it reflects mostly socially and environmentally conscious spending choices. Either way, moving more towards less consumption is an ongoing goal. I am working hard to get beyond my shopping urges. I came across a phase coined by artist Zoe Murphy – “Love what belongs to you.” This phrase now seeps into my thought process when I find an item that would “just be perfect” for the econest. It has made me realize that I do not have to buy green to go green. For those committed to reducing consumption, and saving money without sacrificing style, consider “Love what belongs to you” to be the first line of defense. Let’s examine why we redecorate, how we can keep the cost and consumption to a minimum, and some tips for redecorating and getting decorating right so you don’t waste costly time and resources on design mistakes. Redecorating your home can have a profound effect on your emotional well-being. Creating a sanctuary at home that is uncluttered provides harmony and peace. Visualize what type of home you would like to come home to and create it. Life’s transformations (divorce, job loss, winning the lottery!) require change. Sometimes change is out of our control. Creating a home is within control. You can start over again at home too. Hey, we all grow and change, and the styles of our homes do too. To update changing attitudes and current trends, revamp and redecorate. Treat yourself to a change of interior scene and it might sweep out those stale feelings. You may find a focal point item that makes a new design statement. Redecorating can add remarkable value to your home’s sale price. Energy-efficient and eco-friendly upgrades top the list. This is the ultimate “Love what belongs to you” idea. Display the things you love and put the rest away. Move your furniture around. Knowing what to edit is one of the most important decorating tips I learned. The smaller the space, the more editing you’ll need to keep clutter at bay. Taking a DIY approach doesn’t mean you need to figure it out yourself. You can tap countless resources for step-by-step advice, from the pros conducting in-store workshops to online how-to guides to room by room tutorials. Empower yourself to create more. Clutter begets clutter. Cut it out of the decor of your home and it will help you clear out not just your home, but your life. With the advent of the green movement, more and more folks are shopping thrift shops, freecycle, antique shops, flea markets and garage sales for home decor. Sometimes it just takes a few repairs or new upholstery to make furniture seem new again. When scheming a room, select the fabrics and furniture you love before choosing paint colors. You can always find paint that works with your favorite fabric. A well-made and eco-friendly sofa will last for years and can be recovered over and over again. Keep a small tape measure and list of the wall space available in your home. You never know when you’ll spot the perfect piece while traveling the globe. Before moving furniture around, place blue painter’s tape on the floor to visualize its actual size. A 90″ sofa that looks good in one room might overwhelm another. If you want a well balanced space, measure home furnishings to fit. Size an area rug based on room dimensions, not just a furniture grouping. A larger area rug helps a space feel bigger and makes better use of the room. A good rule of thumb is to allow 6″-12″ of flooring to show between the wall and the rug edge. Some of these tips were adapted from One Kings Lane and Apartment Therapy. 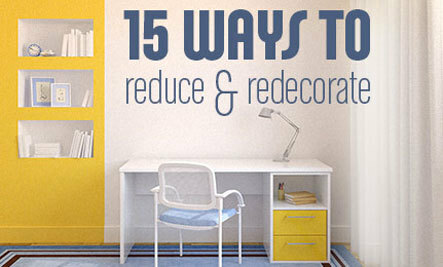 A favorite renovation blog is Remodelista. Simplifying and making better use of the space we have by getting rid of clutter and giving not only giving our living spaces a new facelift but also giving ourselves a much needed change of scenery! Thank you. 30 years of mementos...Oh dear...where to begin?!!? You should not have any emotional attachment to anything to start this process. Interesting article. I'm not much of a change person, but when I do change furniture, I buy used. Food for thought. Good article. A place for everything and everything in its place. Easier said than done for many of us. De- cluttering is an on-going effort. So easy to accumulate stuff- more difficult to get rid of them. Thank you for the sensible and easy tips.